That's Nifty: Hello , hope you are having a wonderful day ! I Hope You are All Having a Great Morning !! WoW Dane's 8 months already!!! It's Taylor's First Day !!! Hello , hope you are having a wonderful day ! 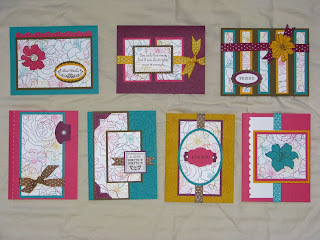 Here is a set of 7 cards I designed for a 'one sheet wonder class', I used the fifth ave floral set to create the designer paper, that is stamped in the new 'in colors' on a 8.5x11 sheet of white card stock.